Lamar Elementary has partnered with the Mineral Wells Art Association to bring a standards-based art program called “Meet the Masters” to our school. 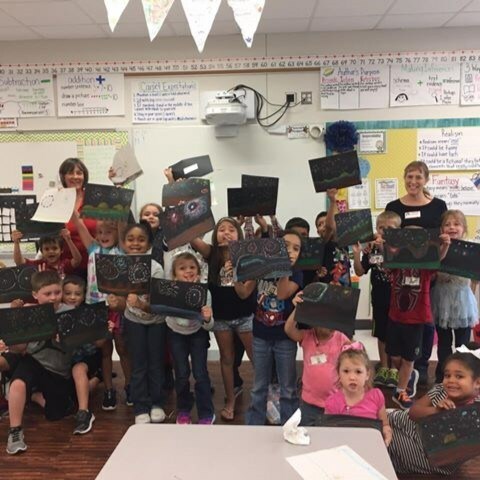 The Mineral Wells Art Association has graciously covered the cost of the art kits so all students can create their own artwork following elements of famous artists. The MWAA is not only providing the necessary supplies, thus saving money for the school district, but they are also providing all the instruction through community volunteers. Teachers have already signed up to bring the Mineral Wells Art Association community volunteers into the classroom starting in October and are eager for students to have these fine arts opportunities. Shirl Hawes of the MWAA presented the famous artist, Vincent Van Gogh in student-friendly terms to kick-off the beginning of the art program. Students “painted” their own artwork using imaginary brushes and palettes, while each assembly had a featured student volunteer dressed as Vincent Van Gogh.